Department of Political Science, Colorado State University, Ft. Collins, CO 80523, U.S.A. This paper relies on online surveys and documentary sources to analyze the implementation of renewable energy policies in American states. State energy program managers indicate that net metering exists in 76% of the states responding to the survey while the mix of clean energy programs varies substantially from one state to another. Moderate regulatory and technological obstacles to implementation include both technological and regulatory policies such as inadequate transmission lines, limited storage capacity, endangered species protection policy and the lack of smart grids. The most influential policy actors are the governor and other state officials, utilities and environmental groups. Overall, the results suggest that state policy research dealing with clean energy is consistent with much of the state environmental protection literature in terms of the relationships between political, economic and technological variables and program decisions. Renewable energy, State clean energy policy, Policy implementation, Policy barriers. The increasing recognition of the finite supplies of fossil fuels and the threat that climate change make the adoption of renewable energy policy an important policy solution that states should pursue. Renewable energy fuels such as wind, solar and geothermal offer cleaner alternatives that contributed less carbon and other air pollutants. Over half the states have adopted more ambitious clean energy policies in the form of a programmatic package commonly referred to as renewable portfolio standards (RPS), an approach requiring that a certain percentage of electrical power generation be linked to cleaner (i.e., less polluting) energy sources [1,2]. While the political climate for the enactment of state renewable energy policies seems to be quite favorable, few if any studies have addressed the challenge of implementing these programs. We focus on states’ clean energy programs to identify the political actors and barriers that have most effect on these policies and seek to explain whether the kinds of state-level characteristics that explain clean energy implementation are similar to those affecting state environmental protection. We begin by reviewing some of the scholarly work dealing with the implementation of state environmental policies. Much of the literature cited here follows the path of state policy implementation research that focuses on the states as the primary units of analysis and looks to the importance of political and economic characteristics of these jurisdictions as important explanatory variables . States operate within an intergovernmental context; hence, scholars are concerned with federal-state relationships as well as accounting for cross-state variation in policy outputs [4,5]. This is often important since state actions on many environmental policies and some energy programs are based on the enforcement of minimum federal standards under delegated authority from federal agencies such as the Environmental Protection Agency (EPA) or the Office of Surface Mining (OSM). The connection between economic factors and state environmental decisions is based, in part, on the belief that state policymakers may be reluctant to regulate firms that generate pollution. Since states compete for manufacturing firms and the jobs they create, industry officials will direct attention to regulatory compliance costs as one of the important factors along with tax structures and access to markets that structure facility siting choices . This presumably leads to a potentially destructive “race to the bottom” form of competition where environmental protection standards are weakened or de-emphasized by state officials in an effort to lure jobs. So a key question is whether regulated firms can exercise disproportionate influence on state program decisions despite federal requirements that uniform environmental protection standards be met. The evidence is mixed on this question. Studies by Williams and Matheny  and Woods  found a link between economic dependency on regulated industries and a willingness to relax enforcement behavior. A more recent analysis of state regulators also concluded that enforcement attitudes were somewhat influenced by industry complaints about regulatory compliance costs but respondents were more inclined to suggest that other factors were more important in shaping actual decisions . On the other hand, economic factors were not found to be significantly related to enforcement actions for hazardous waste policies  or air quality programs . For some regulated firms, the additional costs associated with meeting pollution control requirements were offset by the corresponding reduction in regulatory uncertainty affecting longer term investment decisions [12,13]. What about the relationships between political factors and the implementation of state environmental programs? Some of the more commonly scrutinized variables include various measures of partisan control over the governor’s office and the state legislature, indicators of environmental and interest group strength in state policymaking, and the state’s historical commitment to environmental policy concerns [14,15]. Studies consistently show that partisan factors, notably Democratic control of state political institutions, are related to a preference for stronger pollution control measures  although such findings should be tempered by the intervening effects of other factors such as regionalism and the political importance of within-state industries . It is also likely that states that have shown greater support for environmental policy concerns over time are significantly more likely to maintain as well as pursue stronger state programs . There is also some empirical evidence indicating that that factors such as the strength of environmental groups contribute to stronger enforcement actions in specific programs such as clean air  and hazardous waste  but are less effective in water quality programs where mining interests have succeeded in dampening regulatory efforts [17,18]. These results should be interpreted cautiously since membership figures tell us something about the potential for political action within a state but little about actual efforts or the potential importance of local or state-specific environmental groups. Finally, a study by Newmark and reveals that states with higher membership in environmental organizations are more likely to spend more money on environmental programs in general. There is no direct link to enforcement decisions; however, the exercise of influence may occur indirectly through budgetary politics. How does state action on clean energy policies compare with policy decisions affecting environmental protection? Traditional state-level energy policies affecting the development of coal, oil, natural gas, or large hydroelectric resources were indistinguishable from similar economic interests contributing to the state’s GDP; i.e., policies contributing to desirable goals such as low energy prices and an abundance of well-paying jobs were put forward and eventually implemented by energy companies and utility officials. Project activities aimed at the extraction or utilization of energy resources were often opposed by environmental groups since they often produced harmful impacts to air and water quality . However, environmentalists have responded more positively to subsequent efforts by state policymakers to develop and implement clean energy policies. Unlike many higher conflict environmental protection policies that carry substantial compliance costs for affected industries, many clean energy programs fall more squarely within the realm of distributive politics since it is difficult for political interests of any stripe to argue against programs contributing to greater energy efficiency such as net metering, public benefit funds, or the desirability (in a conceptual sense) of pursuing smart grid technology at the community level . Even within state power agencies such as the Colorado Public Utilities Commission, groups pushing for greater use of renewable energy resources have made headway by consistently emphasizing economic benefits over time. By “softening up” commissioners through repetitive arguments, Laird  suggests that wind power advocates have gained a kind of “participation equity” in agency deliberations. There are few empirical studies of state clean energy policymaking. Vachon and Menz  undertook a cross-state analysis of four specific policies: i.e., renewable portfolio standards, net metering rules, public benefit funds, and generation disclosure rules. Using a combination of economic, social and political variables, the authors sought to uncover the primary correlates of policy decisions. One notable finding was that key economic indicators such as median income and the proportion of electricity generated by fossil fuels were not associated with a lesser tendency to enact clean energy policies. Following Rabe, a plausible explanation is that renewable energy is more likely to be viewed in terms of value added economic development opportunities rather than costly regulatory mandates. On the other hand, the authors did report that both social and political characteristics were significantly related to specific policy decisions, particularly the presence of absence of a public benefit fund. State-level data, gathered from census and interest group reports, are used to evaluate the impact of political, resource and capacity and regulatory policy factors. Political factors include the partisan makeup of legislatures and the governor’s office, the state’s historic predisposition toward environmental values and the relative strength of traditional energy groups. Per capita income, the adequacy of existing transmission infrastructure, and a clear organizational identity within a state department or commission are economic and capacity factors that may have an effect on clean energy policy implementation. Regulatory factors such as efforts to coordinate energy-related land use decisions with private land owners, local government officials, or federal land management administrators are also examined. An online survey was sent to a list state energy managers whose names were collected from the Council of State Governments Directory . Follow-up emails and survey links were sent to managers one, three and five weeks after the initial survey in the spring of 2009. Most questions were closed-ended but we did include a few open-ended questions that asked respondents to list policy entrepreneurs and describe clean energy programs their state had adopted that were not mentioned in the survey. Twentyeight (28) managers answered the survey for a 56% response rate. The analysis reports the frequency of states with clean energy programs and uses descriptive statistics to characterize managers’ evaluations of a) regulatory and technological barriers to, b) political actors’ influence on and c) political actors’ support for clean energy policy. Finally, an analysis of relationships between political, economic and regulatory and technical barriers to clean energy policy is provided (based on a Pearson’s r statistic). Energy officials were asked to identify the clean energy programs adopted by their state (Table 1). The first program, Renewable Portfolio Standards, requires that electric utilities generate a prescribed percentage of electricity from clean energy sources by a specified date. Eight respondents reported the adoption of this policy. The program most often adopted by our survey group is Net Metering, a law that requires utilities to buy electricity from customers who generate their own power. Seventy-six percent (76%) of the states have adopted a law that requires some utilities purchase customers’ surplus electricity. Public Benefit Funds use money collected from electric customers or utility companies to invest in clean energy. Nine states report having such a program. Fewer states have access laws that protect households from obstructions that would block access to wind or solar energy . Similarly, only 7 states report the presence of a decoupling program. Decoupling programs help utilities that lose business when they institute energy efficiency programs by either raising rates when revenues decrease by a certain amount or charging a monthly fee to recover costs . Table 1: A Summary of State Clean Energy Programs. Another potentially important state policy is Renewable Energy Certificates (RECs). Ten states have enacted REC programs which transform clean energy into a tradable commodity. When clean energy is generated, it is injected into the grid and the RECs are traded and eventually spent when used by an electricity customer. The REC frees clean energy sellers from the need to deliver renewable electricity in real time, helping them cope with problems of intermittent production and the task of finding a low-cost resource . The last program listed on the survey is state created efficiency standards. Although the federal government has created efficiency standards for household appliances and some commercial mechanisms, some states go beyond those to create additional standards. In this survey, seven states had additional efficiency standards. Managers were also asked to describe additional clean energy programs that were not included in the survey. One, two or three additional programs were provided by 15 states, 11 states, and 5 states respectively. The programs were a diverse group that included specialized versions of programs mentioned in the survey (such as renewable energy certificates and public benefit funds), a variety of financial programs (such as tax incentives, solar rebates and state funds to promote R&D and commercialization of clean energy) and miscellaneous programs (such as a home energy audit and biofuels legislation). In summary, of the seven programs in Table 1, there was only one program (net metering) that most states had adopted. Between 28.0% and 40.7% of the states had implemented one or more of the six programs. States also listed a variety of additional programs which illustrates a diversity of program choices across the states. Energy managers were asked about factors that limit or help the state to achieve their clean energy goals. Responses were given on a 7 point scale that ranged from limiting (1), neither helps nor limits (4), helpful (7) and the numbers in between. The mean response for each of the seven factors was calculated (Table 2). First, transmission capacity was the greatest hindrance (mean=2.57). Currently, transmission systems are inadequate to respond to demands that result from deregulation in electricity markets. Furthermore, generation of clean energy is likely to be decentralized in more locations, requiring the extension of transmission lines. Second, managers perceived that storage capacity (mean=2.35) was also seen an obstacle to their ability to promote clean energy generation. No doubt this reflects the intermittent nature of wind and solar energy generation that requires greater storage capacity. This limits its availability to more geographically distant markets. It is expected that storage capacity will be enlarged via “…elevated reservoirs; in super conducting batteries, flywheels and magnets; in underground compressed air and natural gas caverns …” . Table 2: Factors that Hinder or Facilitate the States’ Ability to Meet Clean Energy Goals. The third factor, endangered or sensitive species laws, were seen as something of a barrier (mean=3.14). The presence of a protected species is likely to substantially increase the obstacles to siting new power generation, storage and transmission projects. Fourth, Smart Grids, are perceived to be modest obstacles (mean=3.09) largely because they are not currently available in most communities. Smart Grids should be able to store, transmit and distribute electricity. They will deliver both fossil fuels and renewable energy sources that come from both centralized and decentralized locations across the continent with an intelligent delivery system . Amazing as the potential benefits of Smart Grids seem to be, officials may not perceive their absence as a major problem because it is hard to envision the benefits that will accompany their deployment. In addition to obstacles perceived for the first four regulatory factors, there are another three that are perceived to be only slightly limiting or even neutral in their effects on the development of clean energy. Land use regulations and municipal zoning could interfere with future clean energy projects (means of 3.6 and 3.54, respectively). The last factor is right of way restrictions with a mean of 4.05. This is the factor that state energy officials expect to be the least problematic. In summary, none of the factors on the survey were widely believed to help facilitate clean energy goals. Four factors were seen as moderate obstacles, two more were minor hindrances and one was not expected to help or limit. Energy managers were asked to identify the influence that various political actors exerted on state clean energy policy. The level of influence was coded from high (4) to none (1) and a mean level of influence was calculated for 16 different political actors (Table 3). Actors that ranked between medium and high influence included the current governor (3.71), state elected officials (3.71), environmental groups (3.38), public utilities (3.36), state environmental agency (3.33), private utilities (3.27) and other state agencies (3.24). Not surprisingly, current governors and state elected officials who pass clean energy laws are perceived as influential. Similarly, state environmental administrative officials who administer state programs with related concerns are presumably interested, knowledgeable and influential. State and federal officials also were perceived to be moderately supportive (Table 4). The primary targets of these programs, public and private utilities, have economic incentives to participate in the policy formulation and implementation processes associated with clean energy. Although these economic actors are important, there is little evidence that they exercise disproportionately negative influence. State officials report that while utilities are neutral to slightly supportive while federal, state and local officials are in the moderately supportive range (Table 4). On the other hand, environmental groups were influential, a result that would not necessarily be expected in other areas of state environmental policy. 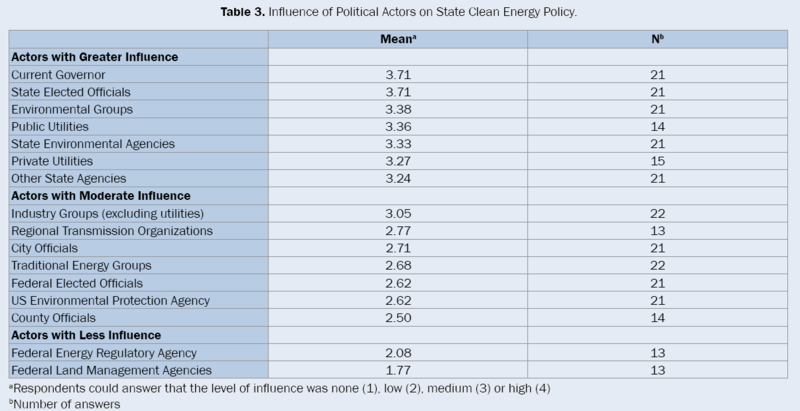 Table 3: Influence of Political Actors on State Clean Energy Policy. Table 4: Levels of Support that Political Actors give to State Clean Energy Programs. Actors with moderate levels of influence include non-utility industry groups (3.05), regional transmission organizations (2.77), city officials (2.71), traditional energy groups (2.68), federal elected officials from the state (2.62), the U.S. Environmental Protection Agency (2.62 and county officials (2.5). By and large, these actors do not have direct authority over and/or are not as directly affected by the economic and political impact of state clean energy policy. Possibly the EPA under the Obama Administration will be more active in the future clean energy policy. Finally, the Federal Energy Regulatory Agency (FERC) and federal land management agencies are described as having the least influence (2.08 and 1.77, respectively). This limited influence is somewhat surprising; in the future, FERC’s authority over interstate high voltage electricity transmission, regulation of the transmission and wholesale sale of electricity and monitoring of energy markets  and siting decisions affecting the rights of way for electricity transmission lines on federal public land (federal land management agencies) suggests that they will be important actors. To examine the political correlates that explain state clean energy policy, an index of the clean energy programs in each state was created as an overall measure of state commitment to the promotion of renewable sources of energy. All states had at least one program, with a single state at this minimum number. Half of the states responding to the survey had seven or fewer programs while the top half of the states had between 8 and 25 programs. The distribution of the index demonstrates diversity among states with the most common (modal) number of programs as four or seven programs. Using the index of clean energy programs, bivariate correlation coefficients were calculated (Table 5) to examine the relationship of political, economic and regulatory variables. Similar to Sussman, Daynes and West’s findings (2002), a political variable is associated with energy programs. In this instance, Democratic control of the upper chamber of the state legislature1 is significantly associated with the administration of more state clean energy programs (r=.454, significant at the .05 level). Economic variables are also important. Higher per capita income2 is positively and significantly associated with more state programs (r=.604, significant at the .01 level), suggesting there is a greater support for clean energy programs in states in which citizens are wealthier. The price of electricity3 is another economic variable that has a statistically significant relationship with clean energy policy (r=.481, significant at the .05 level). Higher electricity prices may serve as an incentive for states to supplement electricity generated by fossil fuels with that generated from renewable fuels. These findings are contrary to Vachon and Menz’s findings that economic variables are not associated with the adoption of clean energy policy. None of the regulatory factors examined in Table 5 has much association with the number of clean energy programs that a state implements. Table 5: Relationships between Political, Economic and Regulatory Factors to the Indexa of Clean Energy Programs adopted by State Officials. This analysis of state clean energy policies indicates that states serve as laboratories to conduct policy experiments, managing a diverse range of clean energy programs that reflect the political and economic needs of individuals and organizations in states. Among the states examined, net metering was the only program found in a substantial majority of states. State officials, utilities and environmental interest groups were believed to have the greatest amount of influence which is consistent with officials’ authority in the policy area and the importance of clean energy to utilities and environmental groups. State managers identified storage and transmission capacity, endangered species regulations and smart grids as moderate obstacles that must be overcome before clean energy goals can be fully realized. Storage and transmission capacity are seen as obstacles, reflecting the importance of technological development to facilitate renewable energy use. Similarly, managers are cognizant of the challenges than an endangered specials can pose to their ability to proceed with renewable energy projects while municipal zoning policies and land use restrictions were seen as minor hindrances. Finally, when associations between political, economic and regulatory and clean energy policy were examined, the political and economic variables were significantly associated while the regulatory variables were not. What are the implications of these findings? Like Vachon and Menz, we found that political factors were significantly associated with clean energy policies; however, our conclusions diverged from theirs in our finding that economic factors were also moderately related with the enactment and implementation of these programs. Our findings are generally consistent with the larger literature on state environmental protection policies. Finally, from a more practical standpoint, our analysis identifies some of the more intractable hurdles that must be overcome before clean energy program goals can become more fully realized. Davis C and Sandra D. State Enforcement of the Federal Hazardous Waste Program. Polity 1999; 31:451-468. Database of State Incentives for Renewables & Efficiency (DSIRE). Find Policies & Incentives by State. Ann O’M Bowman. Implementation Theory and Practice. Glenview IL: Foresman/Little. Brown Higher Ed 1990. Scheberle D. Federalism and the Environment. Washington DC. Georgetown University Press 2004. Rabe B. Racing to the Top, the Bottom, or the Middle of the Pack? In Norman Vig and Michael Kraft, eds. Environmental Policy. Washington DC 2013. Konisky D and Neil W. Measuring State Environmental Policy. Review of Policy Research 2012; 29:544–569. Williams B and Albert M. Testing Theories of Social Regulation. The Journal of Politics 1984; 46:428-458. Woods N D. Interstate Competition and Environmental Regulation: A Test of the Race-to-the-Bottom Thesis. Social Science Quarterly 2006; 87:174-189. Koniski D. Regulator Attitudes and the Environmental Race to the Bottom Argument. Journal of Public Administration Theory and Research 2007; 18:321-344. Feiock RC and Christopher S. Environmental Protection versus Economic Development: A False Trade-off? Public Administration Review 2001 ;61. Carley S, et al. Innovative US Energy Policy: A Review of States Policy Experiences. Wiley Interdisciplinary Reviews: Energy and Environment 2012; 2: 488 – 506. Lester JP and Emmett L. The Comparative Analysis of State Environmental Policy. Natural Resources Journal 1990; 30:301-319. Newmark A and Christopher W. Pollution, Politics, and Preferences for Environmental Spending in the States. Review of Policy Research2007; 24:291-308. Hedge D and Michael S. Regulating in Time and Space: The Case of Surface Mining. Journal of Politics 1994; 56:134-153. Ringquist E. Environmental Protection at the State Level: Politics and Progress in Controlling Pollution. Armonk. NY. ME Sharpe 1995. Hunter S and Richard W. Enforcing the Law: The Case of the Clean Water Acts. Armonk. ME Sharpe. NY 1996. Bryner G. Challenges in Developing a Diverse Domestic Energy Portfolio. New York University Environmental Law Journal 2007. Interstate Renewable Energy Council (IREC). Glossary. Database of State Incentives for Renewable & Efficiency (DSIRE) 2007. Laird F. Learning Contested Lessons: Participation Equity and Electric Utility Regulation. Review of Policy Research 2008; 25:429-448. Vachon S and Fredric M. The Role of Social, Political, and Economic Interests in Promoting State Green Electricity Practices. Environmental Science & Policy 2006. Council of State Governments. 2008. State Directory, Directory III, Administrative Officials. Lexington, KY: Council of State Governments. Smith R. Regulators: Less Demand, Same Great Revenue. Wall Street Journal 2009. Anderson Roger N. The Distributed Storage-Generation “Smart” Electric Grid of the Future. The Pew Center on Global Climate Change and the National Commission on Energy Policy. Federal Energy Regulatory Commission (FERC) -About FERC: What FERC Does 2008.